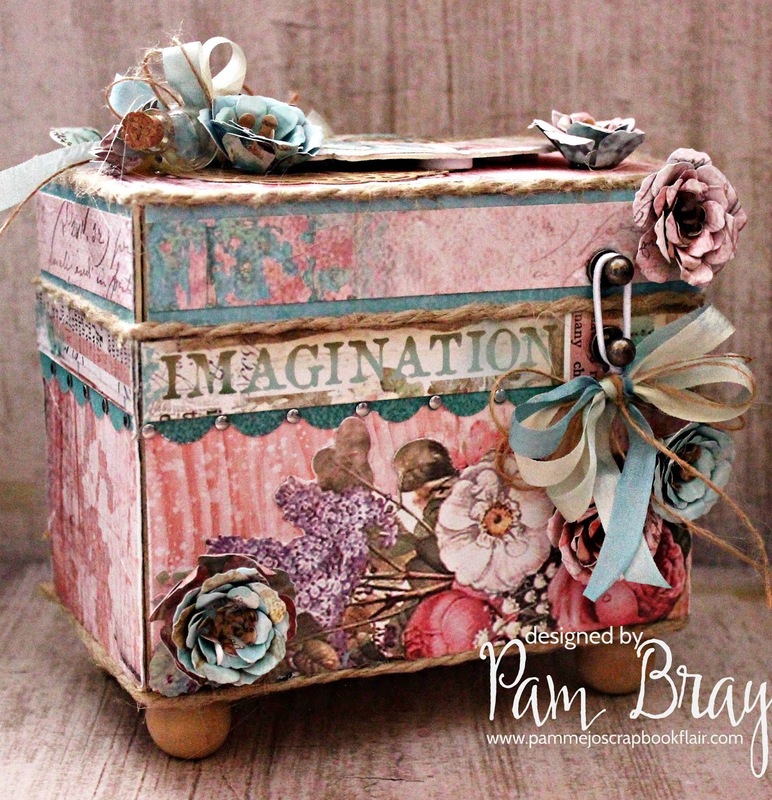 Imagination holds know boundaries when you are creating Spring projects using Eileen Hull's newest Notebook Die!!! 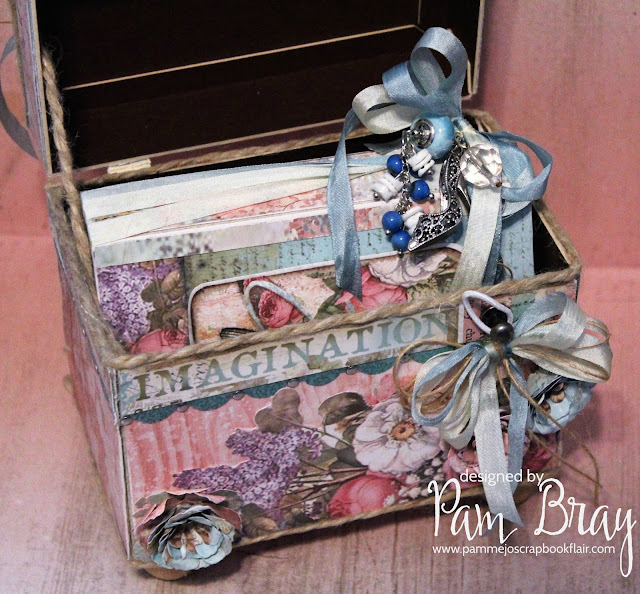 All month long Eileen Inspiration Team will be sharing their love for the Notebook Die!! Needless to say my Moments Notebook is all about "FLOWERS" and dragonflies! I began my Moments Notebook by die cutting the Notebook Die from Sizzix Little Sizzles Matboard; adhere the notebook together at the bind. Cover the font and inside with Stamperia Wonderland Collection. Create pages slightly smaller than Notebook. Create flowers using the Stitchy Flower Die! Create inside pages slightly smaller than Notebook. Add pocket to right side to place Epherema Tags inside by adhering pattern paper on two sides and bottom to form pocket. Add "moments" journal word from the Floral Arch Words to pocket. Fussy cut Epherema Tags from pattern paper; add tan twine. Cover small composition book with pattern paper. Create pocket on pages with strips of pattern paper and border punch. Adhere on two sides and bottom to form pocket. Fussy cut two of the Epherema Tags from pattern paper; add ribbon to top. Add gemstones to scallop border. Fussy cut around pattern paper flowers. Create pocket by adhering top, bottom and left side of fussy cut piece to page to form pocket. 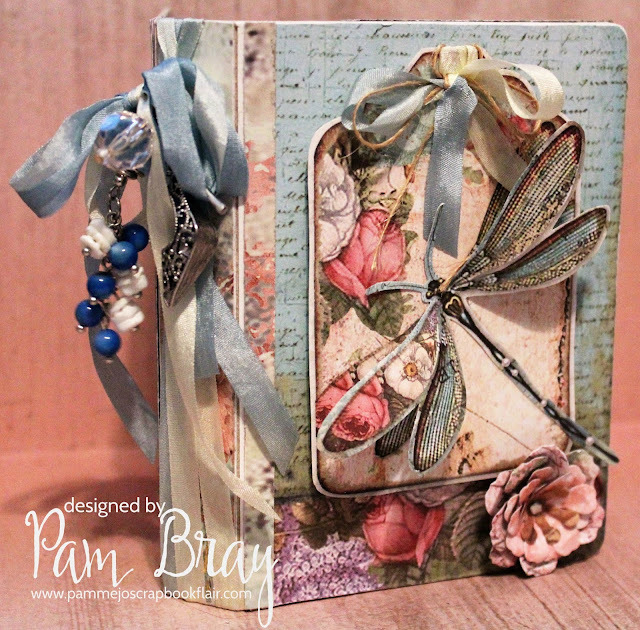 Fussy cut butterfly; add to page. Create 2 Epherema Tags from pattern paper; add tan twine to top of each tag. Place inside of formed pocket. Add prepared pages and composition book to inside of Moments Notebook with blue ribbon. 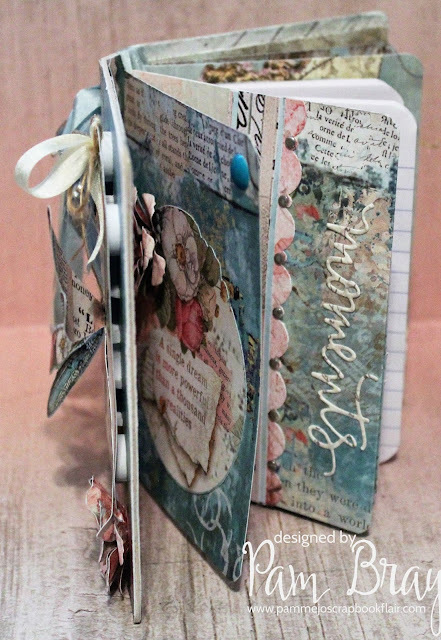 Add Stamperia Wonderland Epherema Tag to front of prepared Moments Notebook. Fussy cut dragonfly adhere to front of Epherema Card. Add small flowers created from the Stitchy Flower Die. Tie planner charms to blue ribbon tie. I hope you are inspired to stop by Eileen's Blog and see more projects from the Inspiration Team. This blog is compensated to provide opinion on products, services, websites, and various other topics. Even though the owner(s) of this blog receives compensation for our posts or advertisements, I always give my honest opinions, findings, beliefs, or experiences on those topics or products. The views and opinions expressed on this blog are purely my own. Any product claim, statistic, quote or other representation about a product or service should be verified with each manufacturer, provider, or party in question.This blog contains affiliate links, clicking and shopping through these links helps to support and run Pam Bray Designs - Scrapbook Flair Blog at no additional cost to you..
Pam, this took my breath away. WOW - those colors, the paper, the flowers you made are all amazingly gorgeous. Love, love, love! Thanks Nancy! So honored you stopped by today, yes I love the papers from Stamperia! Have you worked with it?